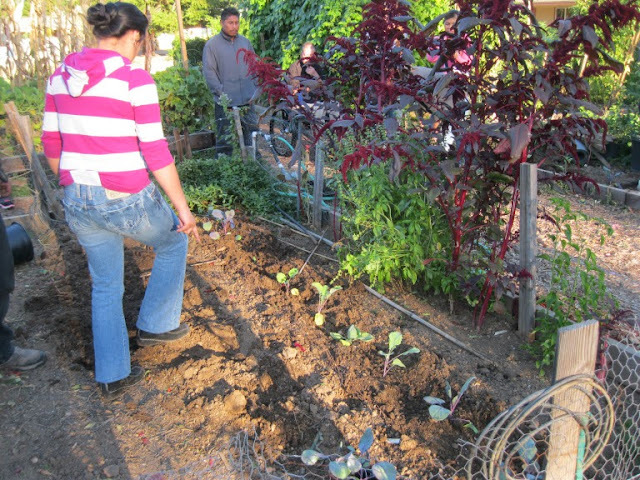 This community garden story is told from the perspective of Steph Logsdon, our Community Healthcorps Service Member. On October 9th, members of the Thunderbird apartment complex in Ukiah learned about nutritious winter crops to plant in their gardens. When Highway 101 ran through Ukiah years ago, Thunderbird was a motel. Now, Thunderbird is a low-income family apartment complex in which most of the residents are Latino/Latina. Some are more recent immigrants from Mexico and most adults speak little English. The mothers of Thunderbird requested to learn more about nutritious crops they could plant to feed their children outside of the traditional Mexican crops they already knew so well. This summer their gardens produced bountiful crops of tomatoes, corn, tomatillos, peppers; gardening is no new thing for them. I myself speak only the bare necessities of Spanish, but with the lingual help of Americorps FIRST 5 VISTA, Ligia Lopes, and my co-worker at the Gardens Project, Caitlin Morgan, we were able to have a successful workshop. For our workshop, I prepared information sheets on planting and care for Broccoli, Cabbage and Collards in Spanish and brought 72 green plant starts to share. After the greetings of “hola!” and “como estas?” we went ahead and started the workshop. First in my broken Spanish naming the vegetables with a poor accent, “Brócoli, Repollo, Quelites!” and saying other English things in which Ligia and Caitlin translating for me, we had the residents read from the Spanish hand out I gave them, learning together about how to care for the plants. I thought maybe one person would volunteer to put a few plants in their garden to show everyone else and then we’d leave the starts for them to plant when they were ready. No, they all got it done right there. Everyone went straight to their garden plots and started digging and loosening the soil right away. Within 15 minutes, most all of the 72 plants that we brought were planted in their garden beds. Only those participants that didn’t live right there took plants home with them. Their enthusiasm and readiness to get the veggies into the ground was inspiring. We barely had enough time to evenly divide up the plants between everyone there. One woman and her child rode the bus to come to our workshop, and there was one non-Hispanic man with his daughter who spoke English that had just moved into the complex that attended as well. Thankfully I had one copy of the planting care still in English for him! All the children around spent their time coloring pictures of cabbage, pumpkins and other vegetables and were proud to show off their art. I didn’t realize how much I could communicate with people by smiling, saying “Si!” and “Bueno!”… over and over and over again. I am overjoyed that the families at Thunderbird take such pride in growing their own food. Even though I couldn’t actually have a Spanish conversation with them (yet, I’m trying to learn), being there with them motivated me to try and learn more for next time.